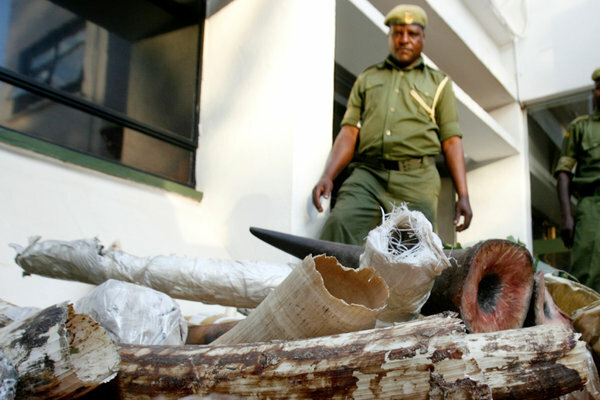 Kenyan wildlife rangers guarding an intercepted shipment of elephant tusks and rhino horns at the Nairobi airport in 2009. HONG TONG, Laos — On an obscure and bumpy dirt road not far from the banks of the Mekong River, the compound of Vixay Keosavang stands out for its iron gates and cinder-block walls topped with barbed wire, a contrast to the rickety wooden stilt houses nearby in the shade of rubber trees. Interviews with government officials in five countries and a review of hundreds of pages of government and court documents compiled by a counter-trafficking organization provide strong evidence that Mr. Vixay, a Laotian, is a linchpin of wildlife smuggling operations. South African authorities prosecuting a case of rhinoceros horn smuggling say one of Mr. Vixay’s companies, Xaysavang Trading, perpetrated “one of the biggest swindles in environmental crime history,” circumventing the law by hiring people to pose as hunters, who are allowed to kill a limited number of rhinos as trophies. In a separate case, Kenyan officials tied the company to the smuggling of elephant tusks for the ivory trade. But the bulk of Mr. Vixay’s wildlife trading operations, investigators say, is the “laundering” of animals. The ruse, the documents suggest and investigators say, involves smuggling animals from other countries into Laos and then exporting them — with Laotian government paperwork — under the pretense that they were bred there in captivity and therefore, in many cases, could be sold legally. The case is especially frustrating to those outside Laos, who say Mr. Vixay appears untouchable as long as he remains in his home country, where, they say, officials have refused to do a thorough investigation despite the reams of evidence presented to them. And without stopping him, wildlife officials and investigators say, they have little hope of breaking down a business empire that they say connects the African savanna to the Asian jungles and ultimately to customers of ivory and traditional medicines in Vietnam and China. Freeland has been instrumental in building a case against Mr. Vixay, and was the source of the vast majority of the documents reviewed for this article, including business contracts and Laotian customs documents that attest to the scale of his operations. Founded in Bangkok more than a decade ago, Freeland is staffed by current and former law enforcement officials from Britain, the United States, Thailand and a number of other Asian countries, and is financed partly by the American government. The nonprofit organization, which works closely with government officials in Africa, Asia and the United States, also provided entree for The New York Times to some of those officials. The Times interviewed authorities from Thailand, China, South Africa, Laos and Vietnam. The booming trade in exotic wildlife has been fueled by rising wealth in China and Vietnam and the demand there for things like the scales of the pangolin, which are consumed in the unproven belief that they help lactating mothers. Mr. Vixay, who is in his 50s, has met this growing demand for animals like snakes, lizards and turtles from his base in the impoverished countryside of Laos, a thinly populated country bordering Vietnam and China and known for its widespread corruption. For years, the inner workings of his syndicate remained somewhat opaque to the Thai investigators trailing him. But in 2011, for the first time, a part of Mr. Vixay’s operations was exposed by the arrest and trial of a Thai man who says he was his deputy, Chumlong Lemtongthai, thousands of miles away in South Africa after an investigation of a rhino-horn smuggling operation. One of the tip-offs for the authorities was Mr. Chumlong’s choice of fake hunters: petite Thai women who turned out to be prostitutes. Thai officials who intercepted some of the rhino horns from South Africa could not believe the women had actually bagged the animals. “It’s a very, very big gun,” one officer said when questioning Mr. Chumlong, according to a video recording by a representative of Freeland who was at the interview. Questioned by Laotian officials after a query from South African authorities, Mr. Vixay said he “had no idea about suspects arrested in South Africa.” But Thai investigators discovered a photo on Mr. Chumlong’s computer that showed him posing with Mr. Vixay, and a certificate at Mr. Chumlong’s office outside Bangkok that said he had been appointed a representative of Mr. Vixay’s company. Evidence at the trial, which included airway bills showing that some rhino horns from the hunts were shipped to one of Mr. Vixay’s addresses in Laos, raised hopes among investigators that his business would be severely disrupted, if not dismantled. But more than a year and a half after the arrest of Mr. Chumlong, who has since drawn a 40-year sentence in South Africa, Mr. Vixay remains a free man. An operative in the smuggling operation arrested in South Africa, Puntitpak Chunchom, suggested a possible reason, telling investigators that Laos was a perfect base for Mr. Vixay because he was untouchable in the country. “He is so well protected that nobody can arrest him in Laos,” Mr. Puntitpak said, according to a transcript of an interview by Thai authorities. Freeland has obtained official Laotian documents that show Mr. Vixay’s company is authorized to breed rare and endangered animals and to sell them within Laos and across borders. A single sales contract from 2009 obtained by Freeland suggests the large volume of animals that Mr. Vixay trades in. Xaysavang Trading, Mr. Vixay’s company, agreed to sell 70,000 snakes, 20,000 turtles and 20,000 monitor lizards to a Vietnamese company in a deal worth $860,000. Experts say the sheer volume of animals is evidence of laundering. Breeding 20,000 of the species of turtle that Mr. Vixay’s company commonly sells — the yellow-headed temple turtle — could take a decade, according to Doug Hendrie, an adviser at Education for Nature, a group in Vietnam that conducts investigations into wildlife crime. In recent years, Thai authorities have intercepted a number of trucks carrying turtles, tiger cubs, tiger carcasses, pangolins and snakes headed for Mr. Vixay’s businesses on the other side of the Mekong River, according to Freeland. In addition, 280 kilograms of ivory — more than 600 pounds — seized by the Kenyan wildlife police was addressed to Mr. Vixay’s company. An item on the seizure on the Kenya Wildlife Service Web site ends with this entreaty, “Kenya’s outcry is to totally stop the bloody elephant trade.” Laotian authorities admit that animal smuggling is a problem but say the evidence against Mr. Vixay is not sufficient to investigate him further. my web site!I guess its adequate to use some of your concepts! !